Member for Casey Tony Smith making the announcement with Councillor Jim Child and local residents. 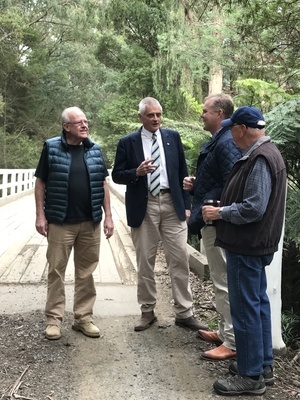 East Warburton locals and visitors to the popular Redwood Forest will experience safer road conditions once a new bridge on Cement Creek Road East Warburton is built over the Yarra River. The federal government is contributing $165,000 towards the total project cost of $330,000. “The popular Redwood Forest is a significant tourist attraction in the Upper Yarra. The existing narrow bridge is inappropriate for the large number of cars now using it,” Tony Smith said. 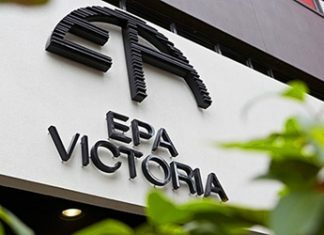 “Visitors to the Upper Yarra region, including many from suburban Melbourne, would not be expecting to travel on a single lane bridge on a road that is narrow and winding. “A contribution of $165,000 of federal funding toward the overall cost will allow the Yarra Ranges Council to replace the existing bridge as well as attach a pedestrian/cycling horse board walk leading to this very popular tourist attraction,” Mr Smith said. Minister for Infrastructure, Transport and Regional Development Michael McCormack said the federal government are committing $640 million for vital bridgeworks between 2015–16 to 2022–23, with an ongoing commitment of $85 million each year following.